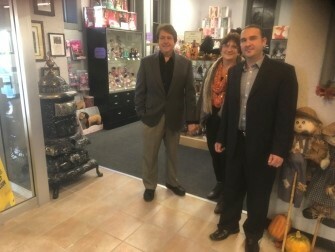 JACK SMILES / FOR NORTHEAST PENNSYLVANIA BUSINESS JOURNAL PAUL, PAULA AND JULIO CAPRARI AT THEIR FAMILY BUSINESS, DUCHESS OUTLET IN PITTSTON. Past, present and future collide at the Duchess Outlet, 75 William St. in Pittston. Julio Caprari represents the third generation at the family business, which continues to diversify and expand. The family owned business — founded by Julio’s grandparents, Sam and Teresa Caprari, in 1956 as garment factory — is housed in the last standing section of the legendary Pittston Stove Company. From the 1860s to 1950 the stove company manufactured hundreds of thousands of coal stoves and furnaces for home kitchens and parlors and twin stoves for restaurants and hotels. On Feb. 20, 1950, one of the largest fires in city history with flames 100 feet high gutted the stove works, sending bricks from the collapsing walls across Broad Street. In 1956, Samuel Caprari and his wife, Theresa, took a chance, bought what was left of the building and started a garment factory, which eventually evolved into the Duchess Coat Outlet. Julio believes his grandparents were visionaries. They were one of the earliest businesses to offer an outlet model, where they not only made, but sold clothes. As homage to its past the Duchess Outlet doubles as a Pittston Stove Museum with stove memorabilia such as a handwritten joint stock agreement, salesmen guides, matches, pamphlets, advertising, log books, payroll books, tools, parts of harnesses for the mules that operated the lifts before electricity and three complete Pittston Stoves restored by Julio’s brother, also Paul. One document in a display case shows the company shipped $175,000 worth of stoves in 1917, the equivalent of $3.2 million today. Though by the 1920s, as many as 250,000 Pittston Kitchen Stoves and Happy Thought Parlor Stoves, as they were called, were in use around the country, very few (no one knows how many) still survive. One of the stoves Paul restored is the only known surviving Union Parlor Stove manufactured between 1869 and 1881. Julio explained the parlor heating stoves as restored by his brother are like works of art. “They weren’t just functional, they were something families had to look at all day long and they are beautiful,” he explained. The Outlet offers a myriad of merchandise for kids from coloring books to a mechanical life-sized reindeer that can an sing and talk and heirloom-quality toys such as Folkmanis Puppets, Kidkraft, Backyard Discovery and Hansa Toys, makers of hand-sewn realistic stuffed animals. The men’s department has outfitted the Pittston firemen and some New York City firemen with American-made Anchor raincoats for their dress uniforms, and HI-VIZ, High Visibility Clothing. Duchess also carries clothing discounted with up to 60 percent off manufacturer’s retail prices, including outerwear from London Fog Raincoats BCBG, Anne Klein, Jones NY, Hickie Freeman, men’s suits and sports jackets. But the dolls dominate the Duchess showrooms. Julio’s mother Paula said she has a vivid childhood memory of seeing Madame Alexander Dolls at the Globe Store. “My parents had to tear me away,” she said. She didn’t get her first Alexander Doll as a kid. “I was married with two children before I got one,” she said. Paula began retailing the Alexander Dolls in 1984. She opened a doll hospital the next year. Today Duchess, with more than 1,000 dolls displayed, is a must-stop for doll lovers. Fifty women from a Harrisburg collector’s doll club visited Duchess a couple weeks ago. Julio said shoppers come to Duchess from Philadelphia and the Poconos, many drawn by the dolls. Looking to the future, Julio’s father, Paul and his wife, Paula added 3,600 square feet of retail space in 2014. The Caprari family is always on the lookout for eclectic retail items to add to their showroom floors. The newest wrinkle is a general line of antiques in a section of the downstairs. Expanding the store again is an option with the potential to add another 3,600 square feet. duchessoutlet.com, they have shipped items worldwide. They are advertising with pay per click Google AdWords, which steers Google users to specific websites with with key words. Julio said he spends 10 to 12 hours a week managing the Google AdWords account. Julio explained the click through rate where a click leads to a sale is only one to one-and-a-half percent, but as the click rate is under 20 cents because the key words are narrowly targeted, “Shopping Wyoming Valley,” or “Minutes from the Poconos” for example.